Diabetes – Why Should We Care? The number of cases of diabetes in the Untied States will “at least double” over the next 25 years, according the December issue of the American Diabetes Association’s publication Diabetes Care. That projection takes the numbers from 23.7 million to 44.1 million. The 23.7 million is at epidemic standards right now. I hope some Americans will see the writing on the wall and make some significant changes to avoid this killer disease. A fellow healthcare professional visited my website recently and commented on the considerable focus of website on nutrition for diabetics. It seemed as though he was saying, “Your website is really great for diabetics, not necessarily for those without diabetes." All of you that read this blog and the newsletter know where I stand. I believe that eating menu items that are perfect for someone with diabetes is a great choice for those of us who do not have diabetes. Although I do not have diabetes, I personally recommend avoiding, and strive myself to avoid, concentrated sweets (sugar, honey, high fructose corn syrup, and so on); saturated fats, trans fats and fatty foods in general; processed foods (like white flour and food-like substances); and frequent and large servings of red meat, especially processed meat. Why should I eat like that if I don’t have heart disease or diabetes? The answer is very simple; I want to avoid the diseases that so often result from eating those foods/ingredients. Can you live in the real world and eat a healthy diet? My quick answer is that it takes some effort. The following is an example of what kinds of things you can do if you want to move toward a healthier diet. Our daughter brought a heavenly dessert to our Thanksgiving gathering. The nice thing about this dessert is that you can have a pumpkin dessert without fussing with piecrust. This dessert held it’s own over a number of pies that were available. I’m sharing the original dessert and a variation using whole grains, no added sugar and extra virgin olive oil. Alissa got the recipe from a friend, but I’ll remember it as Alissa’s. Reserve 3/4 cup cake mix and set aside. Mix the rest of the cake mix, 1/2 c. melted butter and 1 egg (slightly beaten). Press into 9x13 pan. In large bowl, mix eggs (other 3), sugar, salt, pumpkin, milk, cinnamon and vanilla. Pour over cake mix in pan. Sprinkle with topping. Bake 1 hour @ 350. Do not over bake. Mix till crumbly (depending on how melted the butter is, mix might be more like frosting consistency) and sprinkle or drop on top of cake before baking. We so enjoyed Alissa’s dessert, but Dr. Grandpa and I try to not eat too much sugar, butter and white flour. So I made the following variation; it was extremely easy – just 1, 2, 3; no fooling around with a rolling pin and the work of making a crust. When you see the very liquid pumpkin layer, don’t panic – it solidifies just like pumpkin pie. Move slowly as you put it into the oven – no sloshing. This recipe is ideal for those who have ‘sworn off’ white flour, saturated fat and refined sugar – a great option for those with diabetes and those striving not to get it. American-Mediterranean can include desserts. *remove 1 cup of mix and set aside. • Mix the muffin mix (minus the one cup) with the oil and egg. Press into a 9 X 13 inch baking pan. 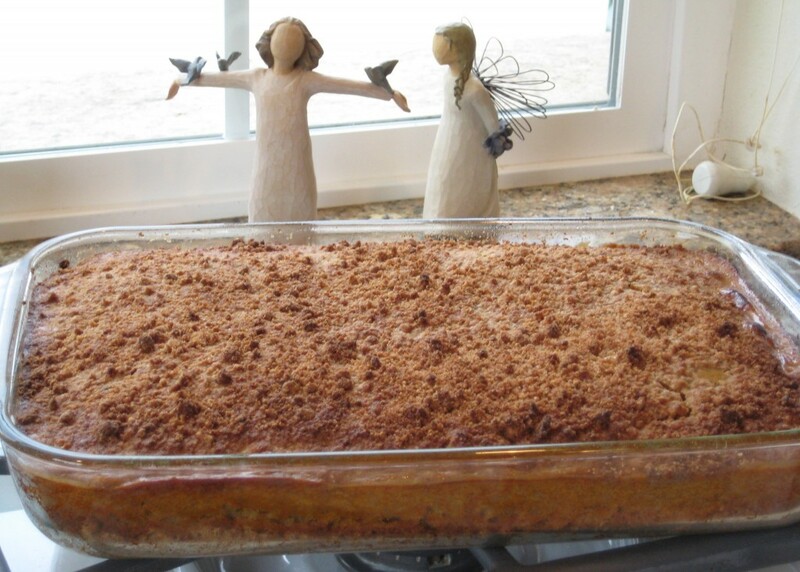 • Mix 3 eggs, Delight, pumpkin, evaporated milk, cinnamon and vanilla. • Pour pumpkin mixture over muffin mixture in pan. • Mix 1 cup of dry muffin mix, cinnamon, Delight, extra virgin olive oil or canola oil. • Bake for 50 minutes to 1 hour at 350° F, until a table knife inserted into the center comes out clean. • Do no over bake. 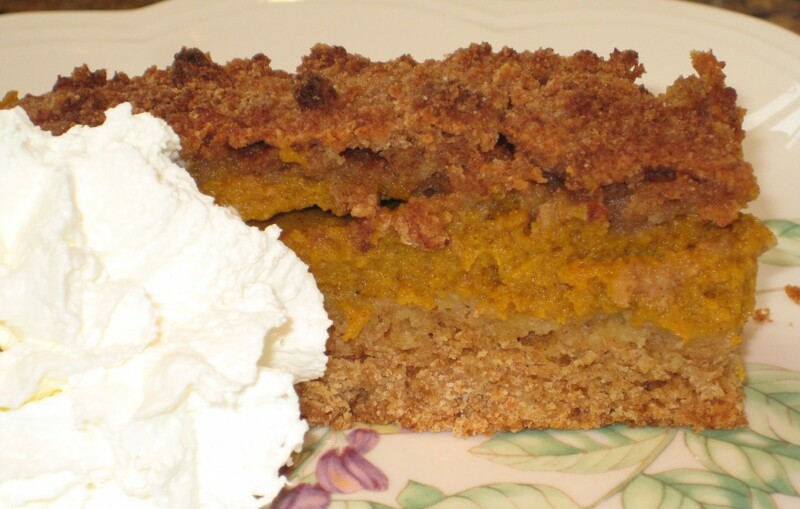 This Pumpkin Cake Dessert Doesn't Need to Wait for a Holiday. Serve with a little whipped cream or ice cream. 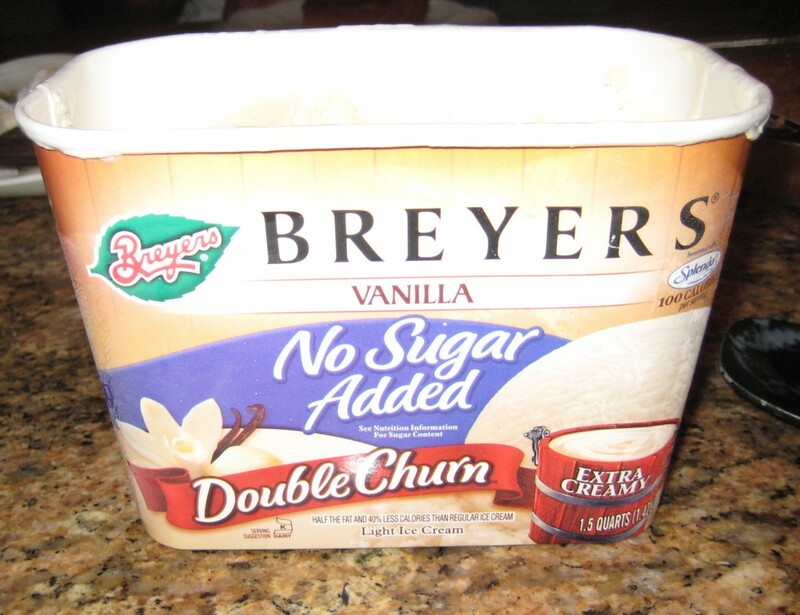 Dr. Grandpa loves ice cream; a little of this helps him enjoy a treat. 12 responses to Diabetes – Why Should We Care? Very nice site! Thanks for the helpful info. So glad that you like the site. Be sure to let me know if there is something that you’d like me to write about. I try to write about a variety of nutrition issues, but there’s always my favorites, like diabetes, the Mediterranean-Style of eating and the food processors that make the food-like substances that annoy me so. My best wishes for a great day. Such pieces of writing are without fail able to soothe my spirit. I just adore reading stuff like this. You’ve gotta continue as you are. It might be a massive shame if you don’t. Your kind words have made my day; I’m ready to hit the keyboard. Have a great day yourself. That’s a posting full of instghi! Glad that you enjoyed it! There will certainly be more. A good friend of mine visits your blog all the time and suggested that I check it out. The writing style is fantastic and the content is pertinent. Thank you for the insight you provide the subscribers! Please let your friend know that I say ‘thank you’ for the referral. I’m glad that you like our writing-style and content. More to come! I enjoyed this post and also wanted to point out that I definitely like the design and feel of your site. I’m utilizing wordpress as well on my blog but have been searching for a template like this which is much much better than what I’ve. I see the theme is listed on the footer so I will take a better look at it. So glad that you liked this post; as you probably can guess that I feel fairly passionately that we should stop looking away from this epidemic. It’s serious and is at the root of much of the heart disease, kidney transplants and just plain human suffering and loss of quality of life. Also, thanks for the complements on the design and feel of our site. Those compliments go mostly to Cory and Mary – they’re terrific!